We've got the same problem with our two retrievers. We use a small cooler as a water bowl at home and will travel with it for outside. Inside I put down a small bowl and the mat I put it on was not big enough in the shake down cruise. 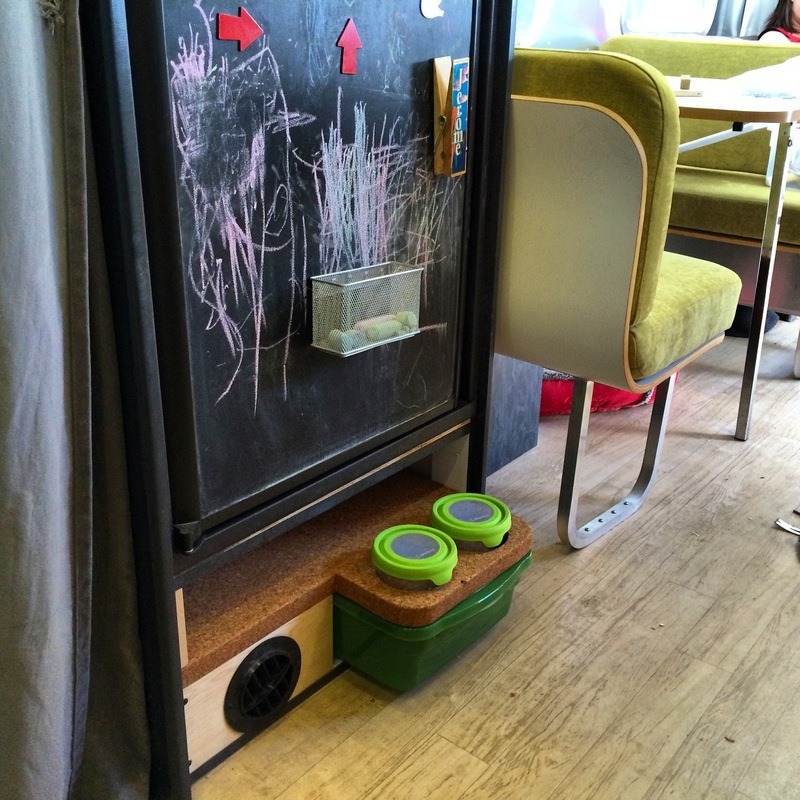 Next plan is to get a bigger mat and put the water under the dinette at night. We keep our Corgis' water bowl recessed partway under the storage compartment under the lobster sink next to the door. The back part of the bowl is supported by a face towel folded in half and the front part of the bowl is on the bath towel that we keep by the door. When traveling, my flip-flops also go in this space, otherwise, they are outside by the steps. More information about this space is seen in my post, "Fired up, and ready to go", on my "History Safari Express" blog, on the Airstream Life Online Community. We use a crate bucket (it has 2 hooks on flat back). It hangs easily on the shower with a rubber backed rug on bathroom floor. Just finished adding a dedicated spot for water and food bowls (and extra food) in the space under our fridge. While I was at it, I added another heat register to supply the main room. The shelf is made from slab cork with depressions routed to keep the bowls in place. Tight fitting lids keep water from splashing while underway! At night, I built a step stool with a flip top and an opening cut to hold a medium bowl in the exposed step area. That is placed on an "iDry Kitchen Mat" (24x18 absorbent pad from Wal-Mart @$11) to catch the inevitable drips and positioned on the linoleum floor at the L of the kitchen cabinets. The mat is great for ensuring a clean floor in the morning and is easily cleaned and dried. It also keeps the bowl from moving about when bumped by a muzzle. Everybody has been creative with their placement. The mat might be a nice enhancement for those with messy drinkers.